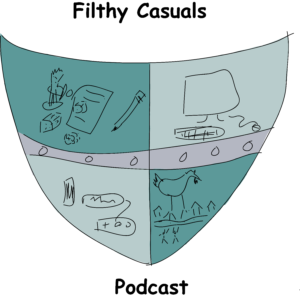 Filthy Casuals Podcast | We work hard and play hardish. We are the Filthy Casuals, the working gamers. We work hard and play hardish. We are the Filthy Casuals, the working gamers. Episode 5 – Squid Goats, Sentinels, and Time Travelling Wizard Dragons Oh My! Better late than ever I always say! This week the gang waxes Legion and wanes No Man’s Sky. Join our five recovering World of Warcraft players as they wax nostalgic about the good ole days when success was measured not in paychecks and stability but blood and glory. For the Horlliance! This week the gang starts a conversation about card games. This week the gang starts a conversation about role-playing games. Episode 1 – Casuals Converge! Join us as we wax nostalgic about what got us into gaming. Anthony on Episode 1 – Casuals Converge!